You know 63 State Street. It's that skinny building at the corner of State and James in downtown Albany. It's both beautiful and kind of odd, standing all dressed up by itself there, like it's waiting to meet a group of other fashionably-adorned architecture. The building has been for sale for a while now, and as the Biz Review reported Thursday, it's going up for auction as part of a package with 69 State Street (the large building just up State Street on the corner with Pearl) -- starting bid $1.5 million. We've always been curious about 63 State, so here's a quick backstory. The building on the northeast corner of State and James was built in 1876 for the Mechanics and Farmers Bank of Albany. The bank had been located just around the corner on Broadway -- in a rather handsome building that dated back to 1814 -- but it moved so a federal building (now part of the SUNY admin complex) could could be constructed. The Mechanics and Farmers Bank chose the architect Russell Sturgis to design its new building. He was from New York City and had studied in Europe -- his style leaned toward the Gothic (he was apparently influenced by a prominent Victorian critic who was a proponent of the Gothic style). Sturgis was known for designing buildings at Yale. And he had recently designed a set of two row houses at 298 and 300 State Street in Albany (at the corner with Dove). Those houses are still there. 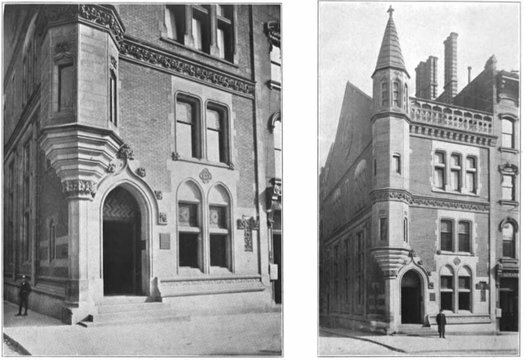 These photos are a 1907 edition of The American Architect and Building News. 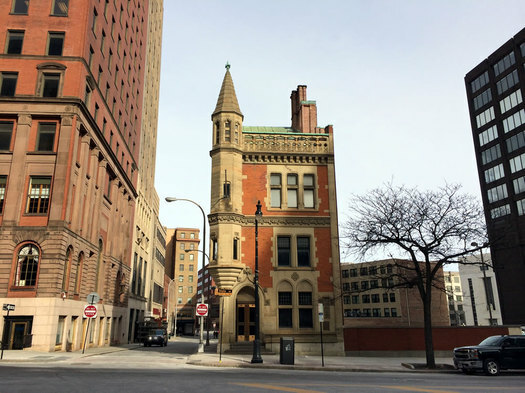 Very much more pretentious and much more successful in its pretentiousness is the picturesque Mechanics Bank in Albany which no sensitive wayfarer can have passed without being moved to some gratitude that its owners should have been moved to employ so artistic an architect. In dimensions and indeed in lay out it is only an ordinary three story house successfully circumvented by the fenestration by the quality of the detail and by the picturesque corbelled turret which emphasizes and adorns the angle. It is a very grateful object in Albany and would be a grateful object in any city of the class of Albany as an addition to its street architecture and as well with regard to its more specific expression as a banking house. And years later in Architects of Albany, Cornelia Brooke Gilder would describe 63 State as "a sliver of architectural sophistication." The M&F building is said to be one of the works for which Sturgis is now remembered. The building looks odd today standing there all by itself, but that wasn't always the case. It originally stood at the corner of two rows of buildings, one along State and the other along James. (This Times Union archive photo from 1935 provides a good look at that corner.) For a while its immediate neighbor on State Street was the Albany Evening Journal offices (which would later move to a new headquarters down the street in what's now the SUNY admin building). The row along State would stand until the 1960s. The section right next to Mechanics and Farmers building was demolished for a bank parking lot (a bank that was not M&F). And farther along the row was knocked down for the office tower that's now 41 State. And what of the Mechanics and Farmers Bank itself? It looks like it eventually became the Mechanics and Farmers Savings Bank, which merged with the Albany Exchange Savings Bank, becoming the Mechanics Exchange Savings Bank -- and at some point moved its location to 41 State. In the 1970s Mechanics Exchange was acquired by Dime Savings Bank, which in 2002 was acquired by Washington Mutual. Most recently 63 State served as the office of Center for Economic Growth for more than a decade. In 2013 the org announced it was moving to 39 North Pearl Street. And the 63 State has been waiting for its next use since then. This beautiful building appears at the 29 second mark in this PSA, filmed at James Street and State St, October 2014. I always wanted to dig into that one, so you've saved me the effort. I know it was still functioning as a bank ca. 1990, but when it stopped I'm not clear. Must say, though, what Albany could use is more sensitive wayfarers who can be moved to gratitude. Manufacturers Hanover in the late 80s, before they merged with Chemical. I recall going there to do some banking, probably in the 1970s. I believe my bank was Manufactures Hanover at that time. Thanks for that story. It is one of my favorite buildings downtown but I didn't know much about it. I hope it finds a good owner and caretaker soon. I remember when my father was the bank guard there in the 60's till they moved the bank to 112 State. I always thought is was so beautiful inside and out. I miss the bar at 74 State. I used to go there just to sip wine and gaze across the street at 63. I have long admired this small, elegant building. 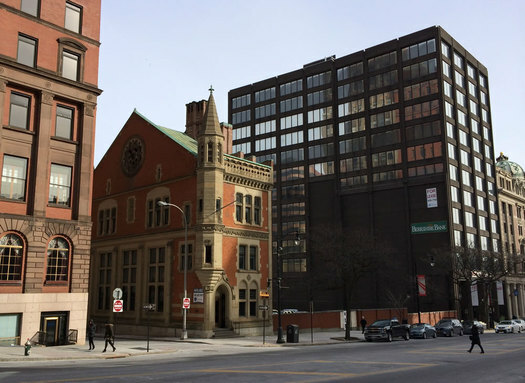 With it's gothic architecture suggesting a somewhat ecclesiastical presence, it would make a perfect chancery for our growing National Catholic Church of America. It would provide both offices, meeting rooms and a residence for the chancery staff. The location would also present opportunities to minister to people in downtown Albany. Remember, too, that a donation to the church of this property would be both providential and tax deductible. Is it protected by Historic Preservation status?? I sure hope so.